Diabetes is a chronic metabolic disorder characterized by a lower production of insulin from the pancreas, less efficient use of the insulin produced by the pancreas or both. In cases when there is not enough insulin or the body doesn’t use it effectively, the sugar levels in the blood will be higher than normal. Insulin helps the sugar from the digestive system move from the bloodstream into the body cells in order for it to be stored in these cells and used as energy. Higher levels of insulin in the body will cause damage to various organs and body tissues. Higher levels of insulin can lead to hair loss as well. Why Does Diabetes Cause Hair Loss? The real reason why and how diabetes leads to hair loss is not known. It is thought to be for various and difficult reasons to identify. If diabetes hair loss is your problem consult with your health care provider. Here are some of the potential reasons. People suffering from diabetes have higher blood sugar levels than normal. This high blood sugar impairs the normal functioning of the circulatory system, chemically reacting with red blood cells, creating glycosylated hemoglobin. This modified version of hemoglobin makes the red blood cells change their normal shape and functioning. Glycosylated hemoglobin is not flexible as normal, which gets stuck when entering the capillaries, the smallest blood vessels in the human body. Normally, this will lead to circulation problems. In cases when the circulation problems occur in the capillaries that supply the hair follicles with blood, hair follicles will die, causing hair loss. Diabetes disrupts the normal functioning of the endocrine system. Normally, the endocrine system consists of various hormones which control many functions in the human body. High blood sugar levels due to diabetes disrupt the normal functioning of these hormones, which leads to various problems in the human body, including hair loss. This is mostly due to androgen abnormalities as the hair shafts fall out, leading to widespread hair loss. In cases when the diabetes is maintained under control, the androgen levels will become normal, allowing the hair to grow back again. Autoimmune disorders are chronic diseases characterized by an attack of the immune system to healthy tissue due to various reasons. The immune system recognizes the healthy tissue as a foreign organism, attacking it and leading to various signs and symptoms. Diabetes can have an indirect effect on hair loss in patients diagnosed with autoimmune disorders as well. Normally, the immune system can attack the beta cells that produce insulin from the pancreas, increasing even higher the levels of sugar in the blood. 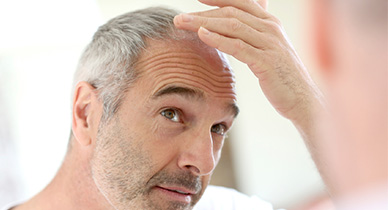 When the hair follicles are attacked, hair loss and even balding may occur. Physical stress – Diabetes has a great impact on the entire body, leading to physical stress, which disrupts the normal functioning of the hair follicles and hair growth cycle. Emotional stress – As diabetes is a chronic medical condition which needs regular sugar blood check-ups, medications or insulin injections for the rest of the life, some people have a hard time dealing with these changes. Watching the diet is also very important. Emotional stress due to diabetes, especially in the very first weeks or months after being diagnosed can lead to hair loss. Infections – Due to high blood sugar levels, people suffering from diabetes are more prone to infections due to having a more vulnerable immune system. Infections can interfere with the normal hair growth cycle leading often to hair loss. Thyroid diseases – Thyroid problems are common among people suffering from diabetes as well. Thyroid diseases can be easily managed with medications. Medications – People suffering from diabetes need to take various medications for the rest of their lives in order to maintain a normal blood sugar level. Certain medications can cause hair loss in some patients. Rapid weight loss – A healthy diet and regular physical exercise are very important for diabetics. This can lead to significant weight loss. A rapid weight loss due to a healthy diet and regular physical exercise can lead to diabetes hair loss. Zinc deficiency – Diabetics usually have a zinc deficiency which will have an impact on healthy hair growth. How to Deal with the Hair Loss? If you want to have healthy hair you will need to eat well. Certain deficiencies in various nutrients such as in zinc, iron, copper, etc., can lead to hair loss problems as these nutrients are very important in the hair growth process. Certain essential oils like lavender, thyme, rosemary or cedar wood essential oils are believed to have an effect when it comes to hair growth. You can always give it a try. Medications such as finasteride or minoxidil are FDA approved for the treatment of hair loss. Keep in mind that both these medications have side effects. Finasteride is only for men. The effect of these medications varies from one person to the other. Laser treatments tend to stimulate the hair follicles, leading to hair regrowth. The results of laser treatments vary from one person to the other. Often these treatments are costly. Surgery such as restoration surgery or hair transplant can be an option for people who have severe problems with hair loss. Various side effects of these treatments are possible such as infections, scarring, etc. Surgery treatments for diabetes hair loss are costly. Keep your hair shorter, about the length of your shoulders. Avoid ponytails or braids as they will damage your hair. Avoid hair dryers or curling irons. Use widely spaced bristle hair brushes for your hair. Use gentle hair care products. Avoid sun exposure, wind or chlorine. What Are Proper Insulin Injection Sites? What Causes Hair Loss in Menopause? How to Reverse It? How Do Beets Help with Diabetes? Does Biotin Help Hair Grow? Why Are Your Nails Splitting Down Middle? Desperate for Thicker Eyebrows? 10+ Tips to Get It!